Even informed observers have been caught asking “what the hell is Merkel up to, and why?” over the past few weeks. The answer is clear, when you look at it, but it’s not mentionable in polite society … Merkel wants bond holders to take a loss as the Core doesn’t have the money to bail out the peripheral nations. Previously, the market had been working under the assumption that the core would sort out the peripheral mess, and that the world would move on – however a few comments last week smashed this assumption. Far from being the death of capitalism – as our deposed PM Rudd claimed – the GFC has turned out to be the death of Social Democracy. It’s simply unaffordable. In almost all of Europe, unfunded pension liabilities are so enormous that the state will simply not be able to cope unless something is done – starting now. Under a business as usual assumption, the BIS estimates that public debt to GDP ratios will rise to 300% in Germany and 400% in France by 2040. These are similar to the levels that Greece, Ireland, Portugal and Spain are expected to hit – the USA was expected to make 400%, the UK 500%, and Japan 600%. As a result, all major nations will have to make fiscal adjustments. 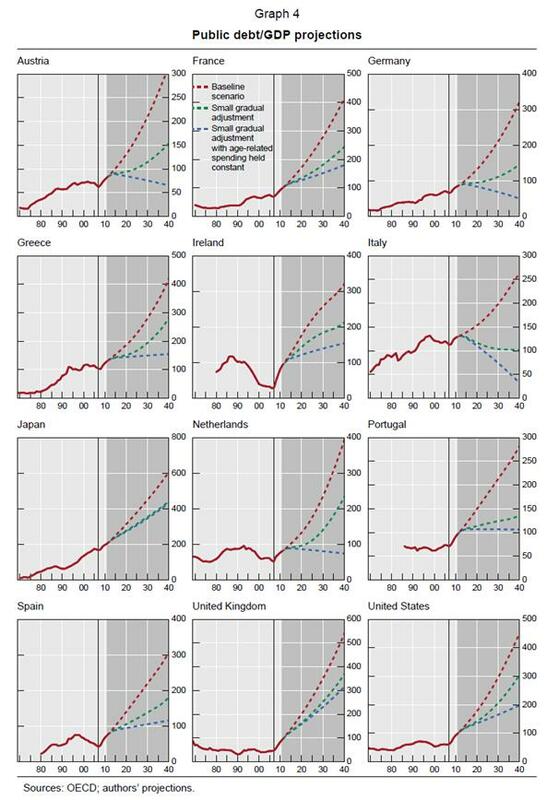 There is scope for public finances to get a little worse, for sure, but the numbers above are pure Ponzi. Therein lies the rub, however, it’s going to be difficult enough to explain to German and French tax payers that retirement has been put off another 5yrs and that their pension – when it does arrive – will be more modest. If, at the same time, the Government is propping up insolvent Irish / Spanish / Portuguese / Greek and banks and Sovereigns, I suspect the French might riot for an extra few weeks, and that the Germans may start wondering if the EMU stuff really is cheaper than Panzers. Faced with this (looming) political and economic reality, it’s totally understandable that German and French finance ministers (and taxpayers) might want bond holders to share some of their pain. It’s natural to begin with Corporate bond holders, but if the fiscal situation keeps getting worse, I wouldn’t rule out haircuts for Sovereign bond holders either. As I see it, there have to be haircuts – pension liabilities are so large that it’s inconceivable they could be fully left alone under all but the rosiest of economic growth scenarios. So, with Pension liabilities needing to be cut, and it seeming politically difficult to cut pensions while bailing out foreigners in (in full), my guess is that these foreigners will be asked to share the burden. This sounds okay in theory – but remember that the banks have a lot of exposure in this space. Both directly via their private lending / asset books, and indirectly in their banking books. 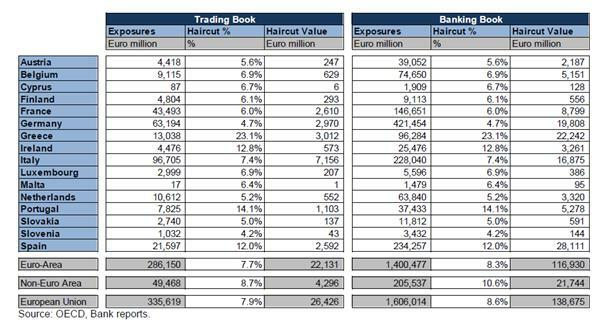 According to the OECD, most of the EU banking sector exposure is on banking books – where Sovs are held to maturity and not marked to market. Thus, any restructure would burn through banking capital. On account of their size, the big losers in all of this would be the French and German banks. Spain is the big threat – according to teh OECD Spain alone would eat through 21% of German Bank Teir 1 capital. Welcome to the genesis of the market state. See The Shield of Achilles, Phillip Bobbit. The very nature of the nation state will have to evolve for the legitimacy of the nation state is being eroded.